However, things become very difficult when you have to find the right forms for this process. If you are confusing about the same, then this post needs your attention. In this post, we will tell about the top 6 Bootstrap 4 login and registration forms that can benefits most in 2019. The next in our list is the Bootstrap 4 authentication form that makes it easier to customize the website according to the needs. It comes with a great set of responsive templates allowing you a cleaner look to the site. It comes with features like login forms, subscribes form, many forgot password forms and personal info forms among others. It is a simple tool that can work on all types of sites adequately. There is a great chance to have a superb effect so that readers get instantly attracted to your site. We will begin our list with a superior template that comes with a top-grade background. There is a transparent form added in this template that makes it different from the background. You can give a pleasant experience to the visitor thanks to its brilliant animation effects. This interactive registration form includes options like username, email, password creation, and confirming the password. That’s not all; there is an option added by developers like a checkbox for terms and conditions. On the other hand, the already registered users can move to the login page from the footer. 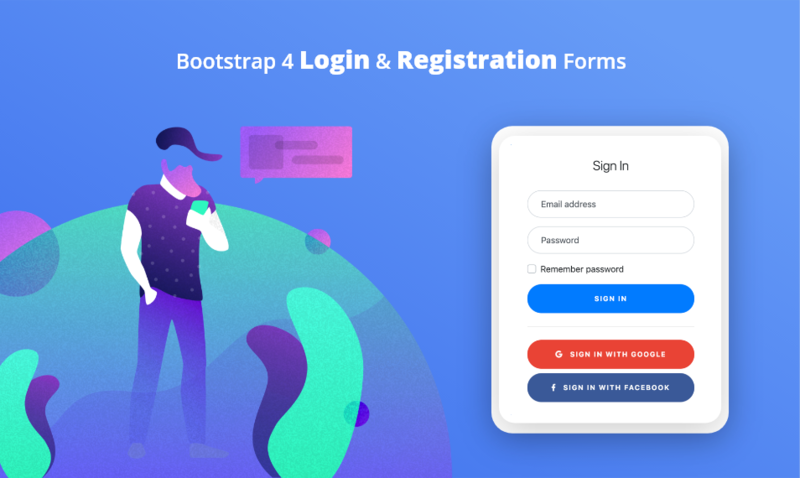 At this position, we have kept this amazing Bootstrap 4 registration form template that comes with two fields, one for a call to action button and another one for information. It is easy to use a template that comes with a great collection of layouts. emplate can be utilized for all types of websites and apps. Overall, we can say it is a brilliant option that you can choose for creating a registration form. If you want to give a solid form to your business website, then this Multi Step Form can be an ideal option to choose. This brilliant option is an ideal alternative to boring forms that don’t attract visitors at all. There is a pretty neat and clean look presented by the visual effects of this template. This form comes with three stages that used for gathering information related to social media, personal details, account setup, and many more. Also, there is a full page form present in this template that equips with an incredible gradient background. Without any doubt, it is one of the perfect free Bootstrap registration forms that you can install in both web and mobile applications. It has a perfectly balanced creative construction along with superior cool effects. In fact, it can be called as a perfect combination of modern design and easy operation. The developer has tried every possible way to ensure the visitor can have a convenient operation with this template. Having a flat material construction, the Merci Signup Form is an excellent choice to make. It equipped with a variety of subtle animation effects and true colours that can make your website look brilliant. There is a human touch provided by this form thanks to “thank you message” that show up after filing the signup form. If you are looking to enhance the relationship with your customers, then this form can be an ideal choice to make. So, which of these Bootstrap 4 login and registration forms you have selected? All of them have distinct features, and you can use whichever suits your platforms perfectly. If you think that we have missed the name of any form, then please tell us in the comment section.